Paul Mellon Centre BA, 9780300047622, 534pp. The vernacular furniture used by ordinary people has only recently been considered a subject worthy of study. 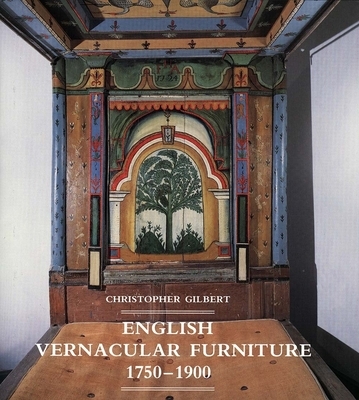 In this magisterial book—the first comprehensive scholarly analysis of English vernacular furniture—Christopher Gilbert demonstrates that common furniture possesses as much interest as fashionable pieces made for country houses. Gilbert investigates over twenty well-defined vernacular subgroups that have never previously been explored in detail, including furniture made for workhouses, schools, prisons, Quaker meetinghouses, army barracks, alehouses, lunatic asylums, shops, railway premises, and ships. He also discusses such facets of vernacular furniture making as regional differences in the production of chairs and beds; mainstream cottage and farmhouse domestic furniture; and traditional straw and wicker crafts. Although Gilbert’s main focus is on the English vernacular tradition, he also touches on furniture form Scotland, Wales, Ireland, the Isle of Man, and the channel Islands. He makes extensive use of provincial Books of Price sand various Parliamentary Reports on living conditions that often contain splendidly detailed first hand evidence about domestic interiors, and he has provided numerous illustrations of securely provenanced items to support his text.